Get your snack on without a load of guilt. 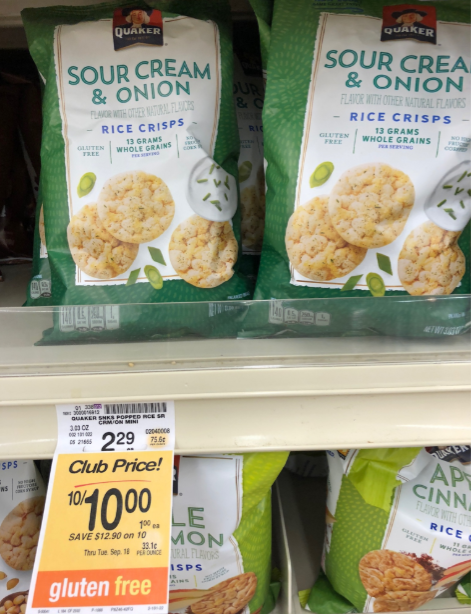 When you shop at Safeway through September 18th, pick up Quaker Rice Crisps for $1.00 each after the sale. You’ll save 56% on this grab and go deal! Final price = $1.00, save 56%! Check out some of the most popular coupons available right now. SuperSafeway is a blog devoted to helping you find the best deals at Safeway in the Denver division. Every week we slice and dice the ad and tell you the best deals at Safeway with and without coupons. For more low prices, check out Super Safeway’s weekly ad coupon matchup page. Want to stay updated on the best deals? If so, make sure to like Super Safeway on Facebook, join our Facebook group, follow us on Twitter, Instagram, or Pinterest and subscribe to our newsletter. Never miss a deal, subscribe now for all the latest from Super Safeway! Thank you for joining us on SuperSafeway! Super Safeway was launched by a Colorado Mom of three, who just like you wanted to save on her weekly grocery bill! We are dedicated to helping you find the best prices and lowering the amount you spend each month on groceries! If you are new to couponing at Safeway, please read our Safeway Coupons 101 and visit our guide to the Safeway Just for U App to learn everything you can about how to stack up Safeway coupons during your next shopping trip. All Denver division Safeway Stores double coupons up to $1.00! Safeway’s weekly circular is released every Tuesday and our team of shopping experts sorts, organizes and categorizes which available Safeway coupons pair best with this week’s current sale. Matching coupons allows you to save the most each week.